On this post, I plan to talk about plants that people commonly put in their gardens for show, not so much for eating. I think it's good to know plants you can use to supplement your other food in case of hard times. I also think it's fun and interesting to learn about. I often add things to my salads from the woods or gardens to make them more interesting like Trout Lily flowers and bulbs (I posted on those on Wild Edibles) and Violet or Pansy flowers. I have to do a disclaimer here. ;) I'm not an expert, and you should check several sources and photos before trying something you have never eaten before to make sure you get the right plant. "If in doubt, throw it out." Some people have allergies to plants that they have never tried before, so it's good to start with a small amount. 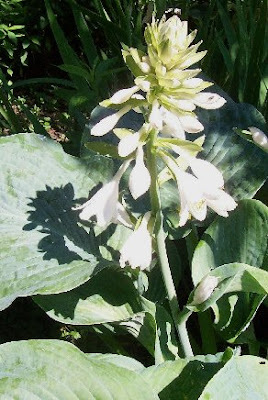 These are also often found growing wild along roadsides in most states. 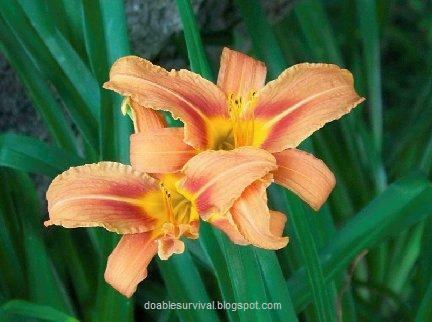 Day Lilies have tubers. True Lilies have bulbs, and you want to avoid those. The young shoots and tubers are edible raw or cooked. The flowers also are edible. The shoots are said to have a mild onion-like taste when fried in butter. Tubers are edible all year but are said to be best in the fall. Young white ones are best though. The flower buds are good sauteed and the open flowers can be battered and fried. There are many things you can do with the shoots, tubers, and flowers. Update: I tried the tubers, raw and cooked; and they were tasty. I also tried the shoots and liked them a lot. They are said to have a mild onion taste, but it was very mild. I sauteed them with a little butter. Very good. 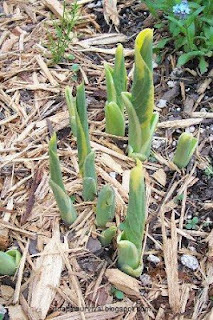 Young Day Lily shoots coming up in spring. 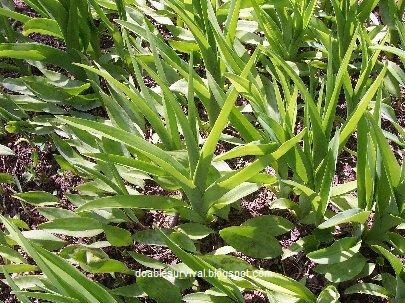 1 Day Lily, young shoots and the tubers on the bottom. tougher skin off the tubers. 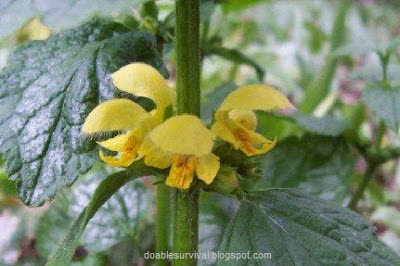 I have the yellow one (Lamiastrum Galeobdolon), and it's called Yellow Dead Nettle, Golden Dead Nettle, Yellow Archangel, etc. 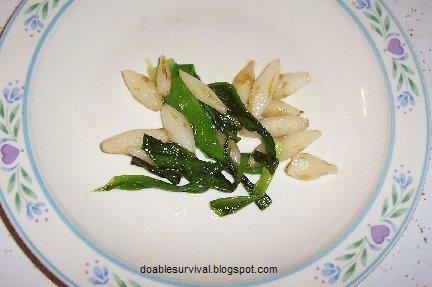 Young shoots and leaves can be eaten raw or cooked, boiled or sauteed. More mature leaves are better cooked as they will be tougher. Some people make a soup, and they can be added to salads. The flowers are edible. I didn't care for them raw. Cooked, they were ok. Some people are very fond of them. I think they would be better in a soup or stew. I saw a recipe somewhere for soup with onion and garlic in with them. Hops are well-known for their use in beer, but the early shoots in spring (for about 3 weeks) are also edible. You can steam or boil them or add them raw to salad. They are said to taste like Asparagus. Now that spring is finally here, I tried them and was pleasantly surprised to find that they do taste like Asparagus. I liked them very much and went to get some more. 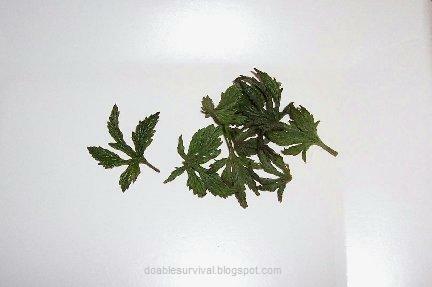 :) Young leaves can be eaten in salads also. 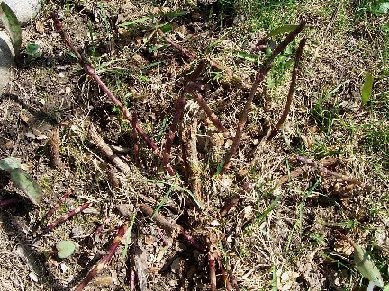 The fleshy rhizomes are sometimes eaten. A tea is made from the leaves and cones. 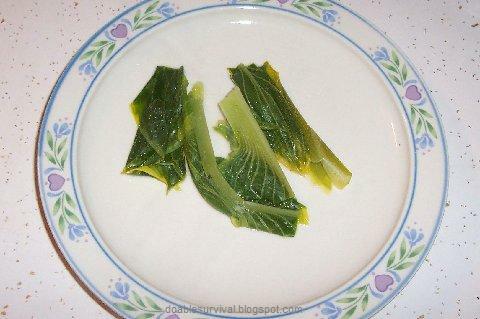 I tried the young leaves raw and didn't care for them, but they were good cooked with the shoots. 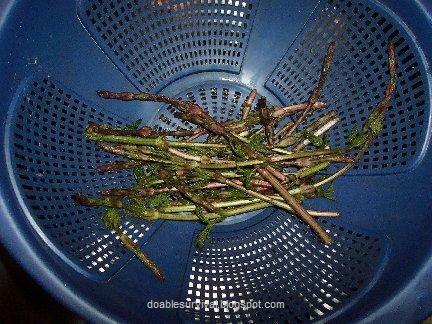 When raw, the shoots and leaves have a fine rough feeling, like fine "pickers". That's what helps it to cling to things that it climbs. 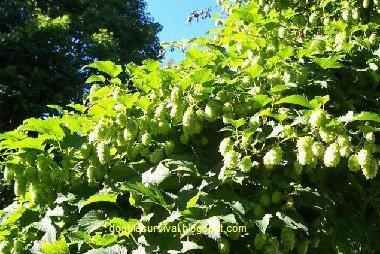 I wanted to mention hops because I have some in my yard, and they also grow on the corner down the street. I'm thinking maybe they escaped from someone's garden? Hops are said to have a soothing, sedative, tonic and calming effect on the body. They were used by the Greeks as a salad plant. Hops are a member of the hemp family and are related to marijuana and stinging nettles. Hops shoots simmered in water. All varieties of Sedum are edible, but the ones with yellow flowers can have a mild toxicity that is taken away with cooking. 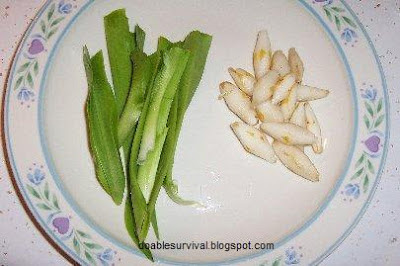 The young leaves and stems are edible cooked or raw, and you can cook the older ones for a short time to make them tender. 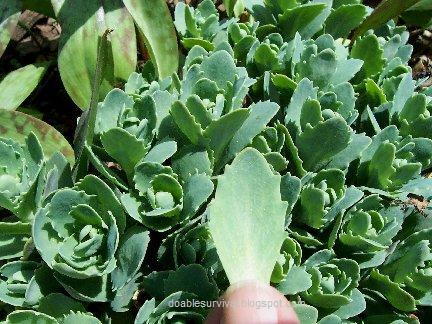 Sedum is good added to salads, stir-fry, soups, etc. 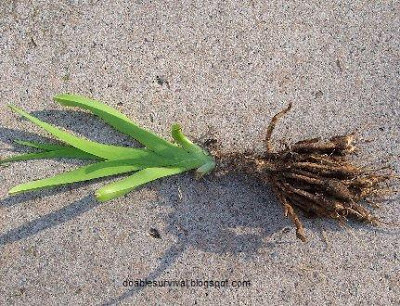 Young tubers/roots can be eaten. Eating a large amount of raw Sedum is said to possibly cause an upset stomach. If the one you try is a little bitter tasting, stir-frying should take that away. 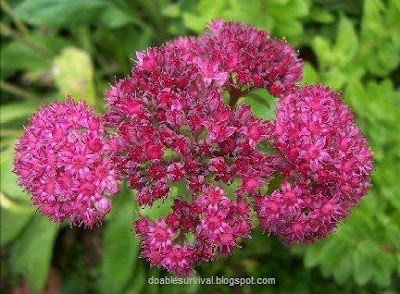 There is also a Sedum that grows in the wild. I have them growing on my property. 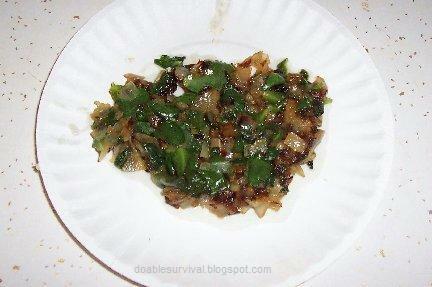 This web site (click here) gives a recipe for relish. "Fry Sedum leaves with slivers of sweet bell peppers and onions at a high heat in olive oil until the onions are browned and bell peppers nearly translucent, then add pepper to taste and use as a relish on hotdogs or gardenburgers. Refrigerate for use as needed." ones are more scrawny looking than the tame ones but still pretty. 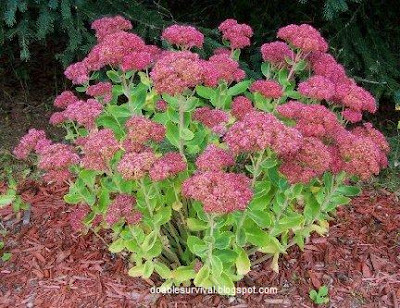 Sedum is also a really great anti-itch mosquito remedy. 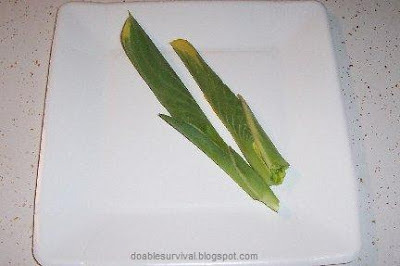 You just crack a leaf and peel off the waxy skin and stick the leaf over the bite. Let it sit for a few minutes and your itching should subside. I pick Autumn Joy leaves and use them whole in conjunction with sprigs of Lovage, parsnip, parsley root, celeriac, carrots, onions, leeks, celery, parsley as a vegetable base when making soup stock (beef or chicken). I also chop them finely and add them to ground meat when making hamburgers or meatloaf. :) This spring, I would pick some of those along with some Hosta shoots and Hops shoots or anything else I could find and cook them together. Yummy. Ok. A question in 2017...anyone there? Hello? Anyway, are the Autumn Joy sedum flowers edible? I want to put them on cakes. Maybe no one would eat them, but I don't want a toxic or horrible taste lingering if they touch other food. They would be beautiful! Sedums are edible, as are pamsy and violet and rose! I haven't seen anything about the Sedum flowers being edible so probably not. 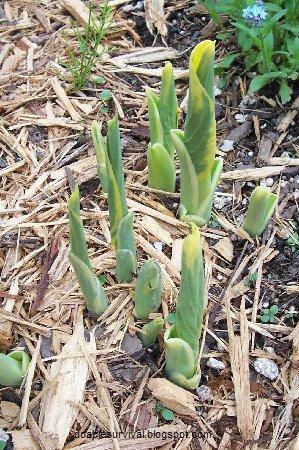 We love day lily buds sauted in butter. 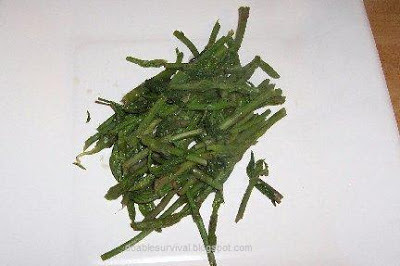 To me they have a taste between asparagus and green beans, delicious. 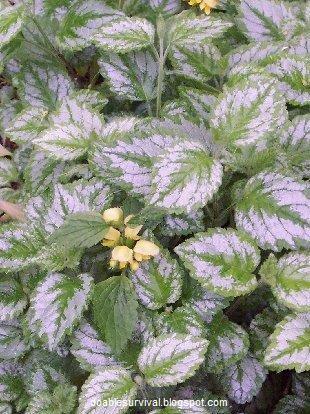 Young violet leaves are also delicious cooked or added to a salad. Young hosta leaves are very tasty. I like to saute them in a little butter and season them with salt and pepper or add them to soup or salad. 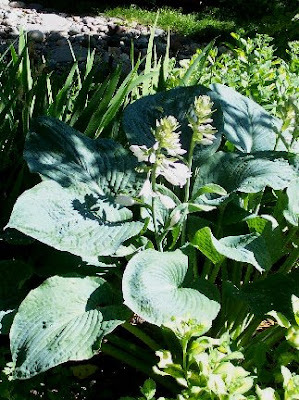 I use the violets and hostas like I would spinach and it is even more healthy than spinach. I've tried Sedum flowers - they're very bitter. I wouldn't call them edible. The leaves are excellent in salads, though.